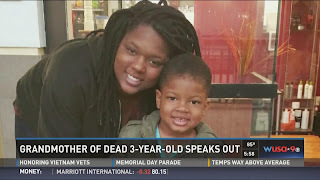 Simms, who is now being treated at a local hospital, is facing no immediate charges in connection to her son’s death. But amid national attention and speculation, Simms’ mother has spoken out to set the record straight on her daughter’s involvement. "[Romechia] would never harm my grandson in any type of way. You know, I just believe she had some type of mental illness, some type of mental break that came upon her where she wasn't able to get herself out of that situation," said Vontasha Simms. Simms says her daughter was diagnosed with depression about three months ago, and had been seeking help for this issue while also trying to take care of her son and deal with their current homelessness. "I don't want people to look down upon her I want people to use the situation as an opportunity to grow, learn from it. Like I said, help your neighbor, if you suffer from mental issues and you need help, don't be afraid to reach out to somebody," Simms said. Neither police nor Ji’Aire’s father are commenting on whether they believe Simms’ mental illness played a role in the 3-year-old’s death. An autopsy has been conducted but a spokesperson for the Sheriff’s Office in Charles County says the findings are incomplete. Police are asking for anyone who may have seen the mother and her son around the time of the incident to contact the Sheriff’s Office with information. GoFundMe pages have been set up by the boy’s father, Donnell Lee, and other family for Ji’Aire’s funeral.